Steve Levitt is the William B. Ogden Distinguished Service Professor of Economics at the University of Chicago, where he directs the Becker Center on Chicago Price Theory. 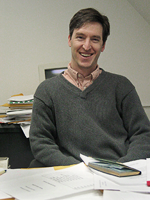 Levitt received his BA from Harvard University in 1989 and his PhD from MIT in 1994. He has taught at Chicago since 1997. Steve co-authored Freakonomics, which spent over 2 years on the New York Times Best Seller list and has sold more than 4 million copies worldwide. SuperFreakonomics, released in 2009, includes brand new research on topics from terrorism to prostitution to global warming. Steve is also the co-author of the popular Freakonomics Blog.